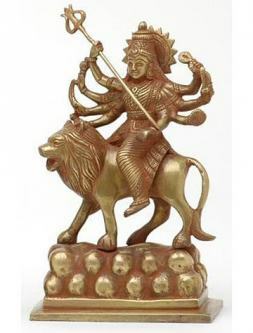 These 8 inch tall brass statues depict the Goddess Durga riding a tiger with a halo behind her. 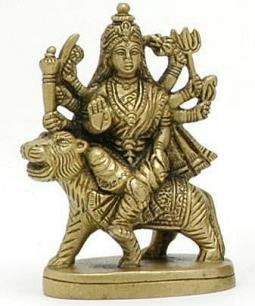 Durga's tiger stands upon a pedestal that rests upon a lotus blossom, and durga has her right hand up in gesture of protection. 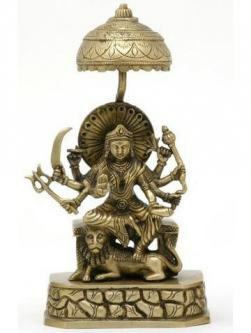 This statue shows the Goddess Durga with a total of 8 arms full of weapons. 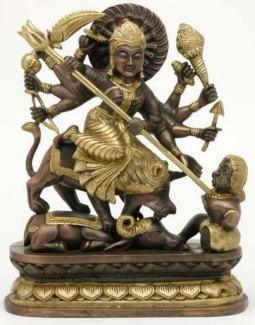 As Devi Durga is a warrior goddess, she is called upon to destroy the enemies of knowledge and righteousness.